Martini & Rossi Logo Stickers. 6" Pair. Martini Black & Clear Sticker. 10". Martini Black & Clear Sticker. 18". 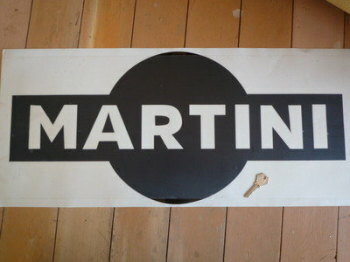 Martini Black & White Race Car Door Panel Stickers. 16" Pair. Martini Black & White Sticker. 10". Martini Black & White Sticker. 8" or 10". Martini Cut Vinyl Logo Sticker. 27". Martini International Club. Belted Logo Stickers. 2.75", 4", 6" or 8" Pair. Martini International Club. Belted Logo with Gold Sticker. 12" or 13.5". Martini International Club. Belted Logo without Gold Sticker. 13.5". Martini International Club. Belted Logo without Gold Sticker. 8". Martini Logo and Stripe Sticker. 6". 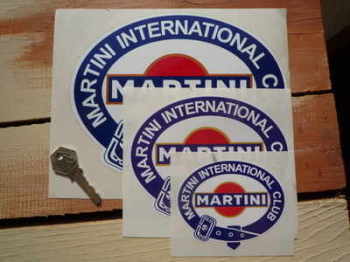 Martini Logo Sticker. Black with Gold Band. 8", 10" or 12". 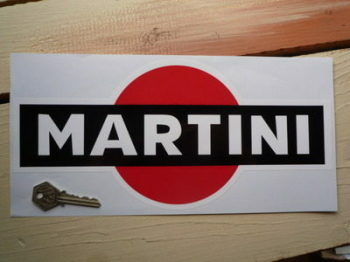 Martini Logo Sticker. Black with Gold Band. Large. Various Sizes. 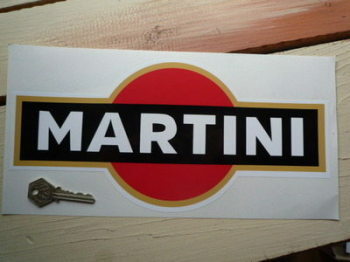 Martini Logo Sticker. Black. 8", 10", or 12". 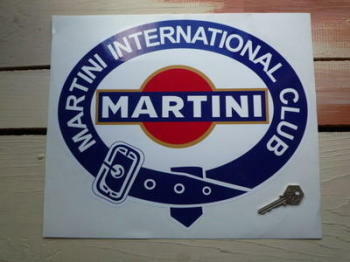 Martini Logo Sticker. Black. Large. Various Sizes. 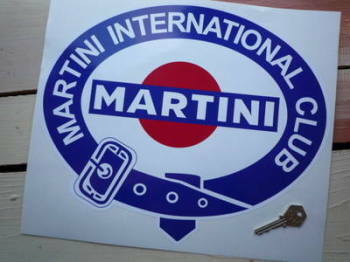 Martini Logo Sticker. Blue With Gold Line. 8", 10" or 12". 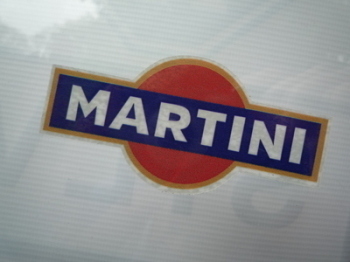 Martini Logo Sticker. Blue With Gold Line. Large. Various Sizes. 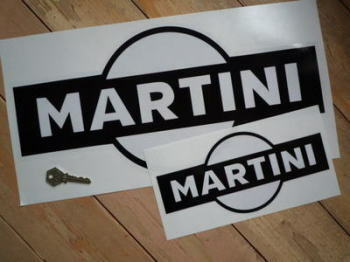 Martini Logo Stickers. Black & Beige. 6" Pair. 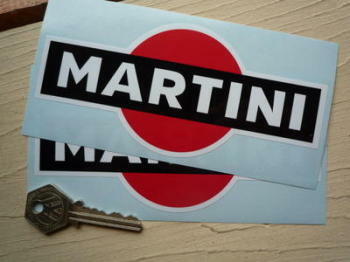 Martini Logo Stickers. Black & Clear or Black & Silver. 3", 3.25", 4" or 6" Pair. Martini Logo Stickers. Black With Gold Line. 3.25", 4", 5" or 6" Pair. 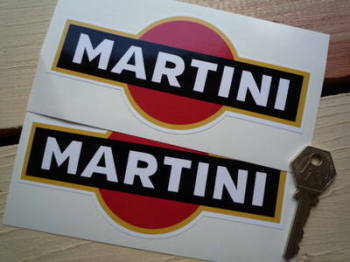 Martini Logo Stickers. Black with No Outline. 3.75" Pair. Martini Logo Stickers. Black. 4" or 6" Pair. 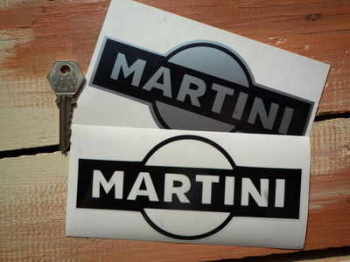 Martini Logo Stickers. Blue With Gold Line. 3", 5", or 6" Pair. Martini Logo Window Sticker. Blue With Gold Line. 3". Martini Oval Shaped Logo Stickers. 7" Pair. Martini Racing Body Stripe Style Sticker. 40" long by 2" wide. 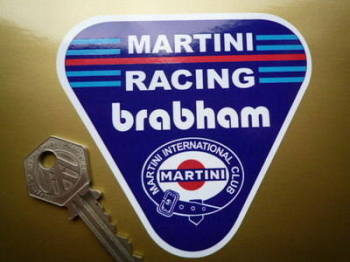 Martini Racing Brabham. Triangle Sticker. 4". Martini Racing Coloured Race Car Door Panel Stickers. 16" Pair. Martini Racing Cut Text Style Sticker. 22". 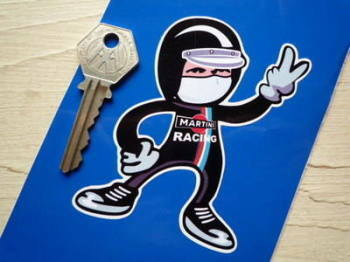 Martini Racing Driver 2 Fingered Salute Sticker. 3.5". Martini Racing Helmet Visor Straight Sunstrip Sticker. 12". 35mm or 50mm Tall. Martini Racing Helmet Visor Sunstrip Sticker. 12".